← The 2016 ECARC Swap Meet or What can $10 get you? I’ve always had a little shop in the house. It’s the spot where I can repair whatever needs repairing. My shop, more formally my workshop, has always been within reaching distance of the oil burner. That means that there is a little extra warmth in the winter. It also means that it is often difficult to hear a radio when the burner fires up. 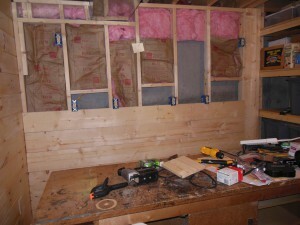 The workshop at our first home had a door, storage racks, an oil tank, a window, and two walls that I covered with 1 x 3 furring. After finishing the walls I put in electric outlets and an overhead light. I even built a set of bookcases and of course my workbench. I made that from a set of plans circulated by Stanley Bostitch. 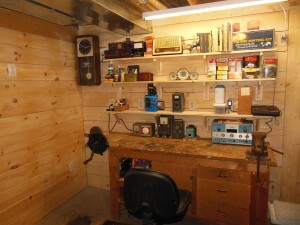 That basement workshop was also my ham radio shack. 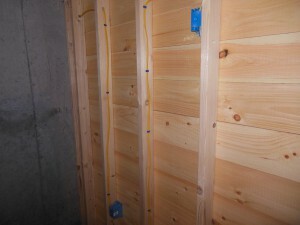 The basement is a great place for a short ground wire. We have been at our new home for six years. About the only thing that I brought from my old shop was the workbench. The ham radio station is on the second floor now. It is not very good for a short ground wire but great for quiet operating. My new shop is of course in the basement, once again a short distance from the oil burner. It has about twice as much room as my last shop but the only window is one of those little deals that sit in a semicircular well next to the foundation. I am completely underground now! I promptly erected storage shelves and they covered up the window. It wasn’t of much value anyways. Only a skinny 10-year old could crawl through it. Little or no light entered that way either since it opens up underneath the outside deck. The new shop had no electricity. I had to run a long extension from the adjacent ‘finished’ portion of the basement to get the power I needed. That is not a very tidy situation. Things had to change. I finally got around to making the changes this spring. I now have a workplace that makes me feel comfortable and at home. I’m not sure if I will have any greater luck at fixing old radios but at least I will have plenty of power and light. There are still a few things to do. I need to hang a couple of cabinets and some decorative stuff. I also have to make room for the bookcase I moved out during the construction. All should be shipshape just in time for winter. For now I intend to spend the summer outside with the lawn, the old Buick, and maybe that cranky old tractor. 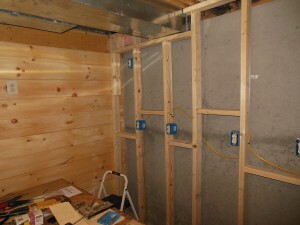 This is the back of the new side or partition wall. I put only one outlet here. I will decide how to finish it later. The panels are all 1×8 shiplap boards. They go together nicely and there was very little waste. The wall is just under 8 feet long. The back wall is against the foundation. It also surrounds the heating ducts at the top. 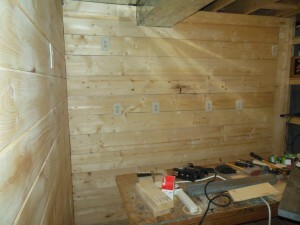 This is the finished side of the side wall. My goal was to create more vertical shelf space and to give my shop a sense of place. The wiring has begun. There are 6 outlets on this wall alone. I don’t want to use extension cords anymore. Previously all electricity to the shop came from one extension. 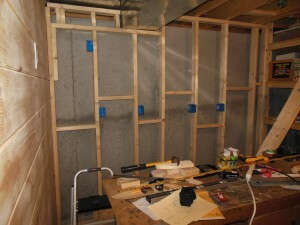 The back wall studs are about 4″ from the foundation wall. I had to do this because the foundation is sloped at the bottom. 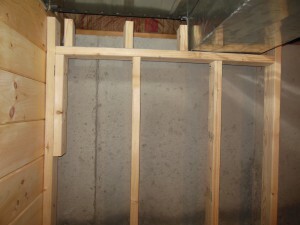 Firestop, including insulation at the top is installed. This is not necessary but I had the materials, so why not? Notice the clutter of tools on the bench. 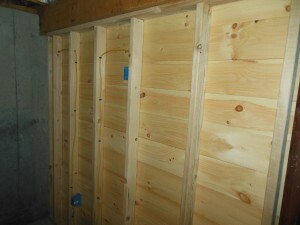 I used ledger board for the back wall. 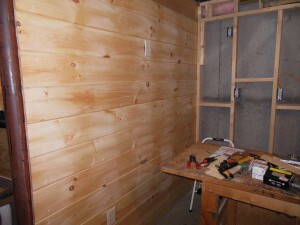 It is rather rough but costs half as much as the shiplap. 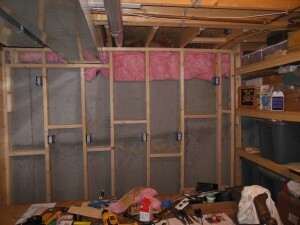 The back wall was slightly over 8 feet long so I had to put one vertical board at the end. It abuts the storage racks. The wall is complete and ready to be put to use. I made some shelf brackets and shelves from the same ledger board that the back wall is made of. The new fluorescent light does a nice job of illuminating the workbench. Some of these items are functional and others just collectible stuff that I think is neat. 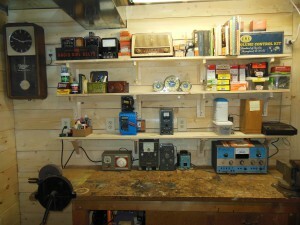 I hope that the new shop will encourage me to put more of an effort into fixing up old radios. 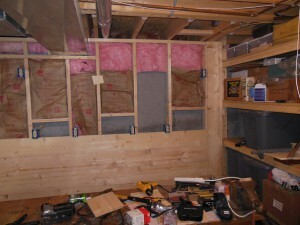 This entry was posted in Occasional Commentary, Radio: Amateur & Broadcast and tagged build, ledger, radio, repair, shelving, shiplap, shop, vintage, wiring, workbench. Bookmark the permalink.